Copyright 2009 Peter Lang Publishing Inc. In 2006, Australia's conservative leaders publicly declared climate change a threat and nuclear power a solution, "If Australia does not engage, if we sacrifice rational discussion on the altar of anti-nuclear theology and political opportunism, we will pay a price. Maybe not today or tomorrow. But in 10, 15, 20 years' time, Australia will assuredly pay a price," then Prime Minister John Howard (2006b: 13) said in a speech in July of that year. And November 2006: "But if we're worried about climate change, then we have to bring about some reduction in the greenhouse emitting properties of coal and once you start doing that you add to the cost of its use and that then. brings nuclear in the equation. That's the simple proposition" (Kerr, 2006: 1). This "simple proposition" is, of course, unique neither to Australia nor 2006. Over several decades and much of the industrialised world, a pattern has developed that sees nuclear issues emerge in various forms onto the public agenda during periods of heightened concern about the environment (Carvalho & Burgess, 2005; Gamson & Modigliani, 1989; Lowe, 2007). However, the Australian experience of 2006 was a particularly intense coupling of these two issues, and the public debate that was subsequently played out in the news media is worthy of close scrutiny for what it reveals about the complex role media play in framing political conflict and environmental risk. The chapter focuses on the coverage of climate change and nuclear power in Australia's only national newspaper, the Australian, which led the country in coverage of the energy debate in terms of the number of stories it gave to the issue (Media Monitors, 2007). It analyses, in particular, two periods of coverage. The first is May 2006, a month of intense debate about nuclear energy immediately preceding the prime minister's official announcement that Australia's nuclear options would be reviewed by a high-level task force. 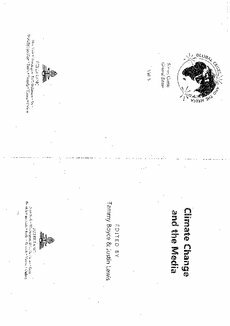 The second is February 2007, when the Intergovernmental Panel on Climate Change (IPCC, 2007a) released the first part of its most recent series of reports on climate change, this part dealing with the science. These two "critical discourse moments"-periods and events that create uncertainty and test "existing discursive positions and constructs, Of, in contrast, may contribute to their further sedimentation" (Carvalho, 2005: 6) - coincided with the commissioning by the Australian of News poll surveys, which included questions attempting to gauge Australians' support or otherwise for nuclear power. This chapter does not attempt to make any detailed claim on the connection between media discourse and public opinion. However, the poll results are of interest as they were publicised by the Australian at a time when crucial policy decisions were being made (Shanahan & Marris, 2007.; Australian, 2007a; Australian, 2007b; Lunn, 2007; Shanahan, 2007; Warren, 2007). According to the Australian, the results suggested a shift from a majority opposed to nuclear power stations being built in Australia to, six months later and with the question rephrased to reflect the content of what by then had become a major and sustained public debate connecting nuclear energy and climate change majority support for nuclear power.